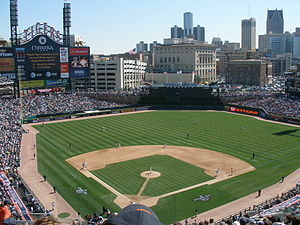 The park is named after Comerica Bank, which was founded in Detroit and was based there when the park opened. Comerica’s headquarters have since been moved to Dallas, though the bank still retains a large presence in Detroit. The stadium’s seating capacity is 41,255. There is a Detroit People Mover station about a block from the stadium (at Grand Circus Park). Comerica Park sits on the original site of the Detroit College of Law.